He also explained there is no civilian firearm carry permit in D.C. The District of Columbia also doesn’t have reciprocity with other jurisdictions. 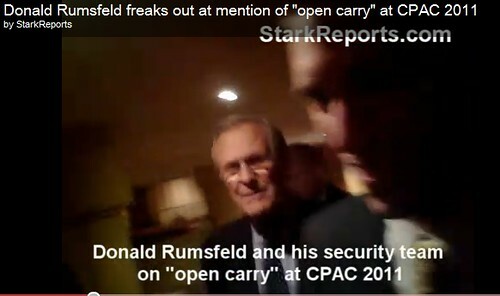 So some congressman from Florida who got himself a gun, couldn’t bring it to CPAC. If he did, he would be arrested. . . .
1. The security professionals ask them not to write about it. The professionals don’t want to reveal any details to the media in case bad guys will use it to compromise security. That is one reason that I write and publish these stories after the events are over. 2. They don’t want the “more guns make us safer” crowd to swarm them and petition to bring their guns to the event. The people who believe that their 2nd Amendment rights are infringed when they can’t bring their guns to an event are much more apt to complain than people who think the policies make sense. The professionals know that wading through a crowd of heat-packing amateurs who think they are in Deadwood is a recipe for disaster. 3. The media know that even asking a question about guns around a conservative politician gets a massive security response.